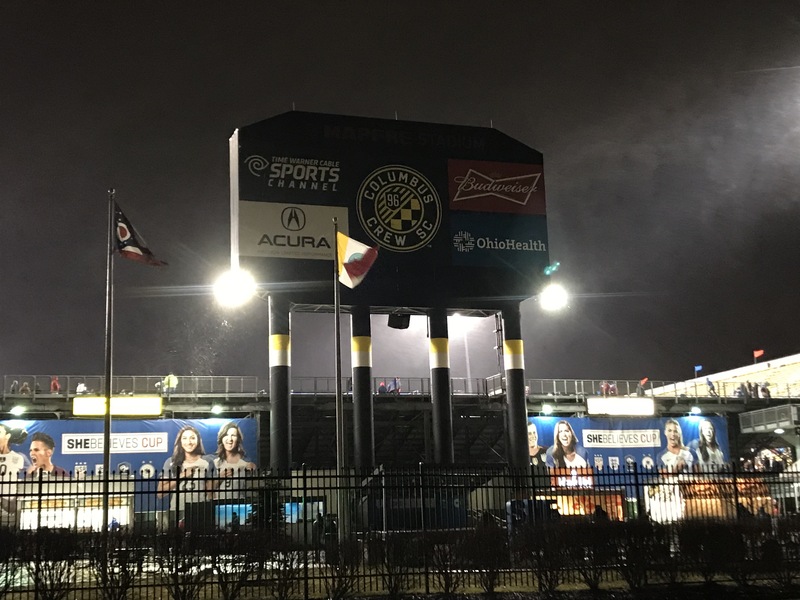 One of our favourite weeks in the international calendar got underway last night in a stormy Columbus, Ohio. Having eventually beaten Storm Emma over in England (including a 3-hour delay to our flight and a mini-stop in Boston), we landed in Columbus on Thursday morning as Storm Riley was getting underway. The weather in the area began to deteriorate throughout the day and by the time of the first kick-off, provided some really challenging conditions. For England, it was of course Phil Neville’s first game in charge. After all the talk on either side of the merits or not of this appointment, this was Neville’s first test in the hot-seat and not many come bigger than this match up. England have only managed to beat France once since 1972 – that victory came in a tight 1-0 victory at last year’s European Championships. They have been, by all definitions, our bogey team, and one of those fixtures as fans of the Lionesses that you both love and hate. As for this tournament, the Lionesses have found it tough going in the past but have improved year on year. They were unlucky not to come away with a win against France in the 2017 edition, conceding a late goal to hand their opponents the win. The foundations had been put in place under Mark Sampson’s tenure, which Neville has been keen to emphasis. With the added bonus of the players no longer being in pre-season (they have all been playing since September), it was on the cards for them to be able to show even more progression under new leadership this time round. Neville did have an injury headache to overcome. With captain Steph Houghton out, he will have been relieved to see Millie Bright recover from a bug. Her centre-back partner was Anita Asante, returning to the international fold and a player who she has partnered with for most of 2018 at club level. Up-front, he opted for a very attacking set-up with Jodie Taylor leading the line, supported by Fran Kirby a little deeper and Toni Duggan and Nikita Parris out on the flanks. While feeling positive, if a tad nervous, what happened over the next 90 minutes was probably beyond the majority’s wildest predictions. England attacked the game with the same gusto as the swirling wind and were 3-0 up by half-time. With Kirby and Parris influential, Duggan, Jill Scott and Taylor all got themselves on the score sheet. France seemed shell-shocked. Kirby got in on the fun herself shortly after the break before England took their foot of the accelerator a little. The one blip on their day will have been the consolation goal for France in the 77th minute. Gaëtane Thiney decided to have a go from about 25 yards out and her shot got a wicked deflection off the back of Bright to send Karen Bardsley the wrong way in between the sticks for England. Neville set the team up to play attacking football and the Lionesses’ forward line seemed to revel in their freedom to break. The link-up play for most of the game was a joy to watch and they could have added more to their tally. “I think we’ve carried on from where we left off at the Euros. You saw the strengths in attack at the Euros and I think the girls have picked up from there. Phil’s come in and we’re trying to play a lot more football to feet. Sometimes it suits some players, sometimes it doesn’t – I think tonight has shown that we’re coming out of our comfort zone and there’s a lot more to come from us. I think that’s the most positive thing for me – we see it in training all the time and it’s very exciting. In the past, we have been used to seeing Fran Kirby either partnering Jodie Taylor up front or as part of a front three. Against France, however, she took up a deeper role in the attacking setup that made her instrumental to much of England’s attacking moves. By the way she slotted into the midfield alongside Jill Scott, you would have thought she had been there for years. It was only Keira Walsh’s second start for the Lionesses but she took the occasion and the opponent in her stride and provided the composed performance that we have come to expect from the 20-year old. As good as England were – and they were very good – it should be noted how poor the French were. Corinne Diacre had named a young side, granted, but the lack of cohesion and fight, especially from the more senior players, they displayed throughout the game was surprising. It was only a year ago that they won this tournament so their decline – including their Euro 2017 appearance – must be a worry. They host the world’s biggest tournament about 18 months and with not much competitive football in between, the challenge is there to get things fixed and back on track. The weather was awful! Storm Riley swept in bringing gusting winds, ridiculous rainfall and even some snow. With the weather moving east towards New Jersey, the next destination, it does not look like it will let up any time soon. Flights have been cancelled and many people are figuring out how to make their way across the country, with options limited. This, coupled with last year’s freezing conditions, must make US Soccer re-consider the locations of the tournament. Tagged england, football, football blog, france, International football, lionesses, Phil neville, shebelieves cup, women's football.